← what i’ve been up to! toddlers need a new activity every 3-7 minutes…..
That’s a true fact and a VERY hard thing to accomplish when you have to fill an entire day with a toddler!! Living in Southern California our children are so lucky they get to spend so much time outside. Or at least they have the ability too!! I’ve always been good about getting them outside whether it’s on a walk, or just hanging out and reading books on the grass, swinging together on the swing-set or even a picnic lunch or dinner. But, the longer I’m on Twitter and reading blogs I realize how lucky we REALLY are with our amazing weather almost all year-long. I’m not an idiot, I’m very familiar with the weather in other parts of our country and have no questions about that. But what I’ve really learned and come to realize is how easy we have it out in Southern California that we CAN utilize the outdoors as an activity year ’round. We don’t have to spend 20 minutes bundling up to run a 10 minute errand in rain or sleet or snow and then 20 more minutes to un-bundle. We don’t have to worry about cancellations because of weather and life is just really really easy in a lot of ways because of our weather and Twitter, Facebook, Instagram and the blog world have REALLY made it clear and REALLY made me appreciate what I was born into and where I’ve lived most of my adult life (and have no plans to leave anytime soon!). We have our own challenges, traffic, don’t get me wrong, but as far as entertaining children and options, we are EXTREMELY lucky and fortunate! That being said, it’s triggered A LOT of the ideas I have up my sleeve from my Early Childhood Education and my experience as a Preschool Director. Sometimes, you just have to have things in your imaginary pocket to pull out when you need them! Whether it’s an extra cranky day for either of you or both, or the weather is bad so you’ve been housebound for several days or even when someone in the house is sick and you have to stay in, the hardest part is coming up with enough things to do to keep everyone busy and out of each other’s hair! Am I right? So an idea I want to share, most specifically for you all in other parts of the country where you don’t have the abilities that we do, or certainly as a new idea for you mommies maybe in hot weather or for a rainy day activity. Like I said, I don’t believe that you can ever have too many ideas in your back pocket when toddlers and children are concerned! Ours has a little train track and 3 funnels built in……it’s pretty cool and I’ve seen the kids do some really fun and creative stuff with it! Water Tables!! They are AWESOME!! If you have a toddler and don’t have one, GET ONE! Find a used one. Borrow one from a friend or relative! They are hours and hours and hours of endless entertainment for any child. There are ones as inexpensive as $19.99 that I’ve used that are awesome and if you can spend a little more there are ones that have a few more bells and whistles. Either way they are a great way for your child to play and beat the heat, give you a little breather to sit down and watch, and them to explore with different things in the water and keep cool. We use cups, pitchers, bottles and bathtub squeezy toys. Animals! Trains! There’s almost nothing that hasn’t made its way into the water table by now! But, that’s a warm weather activity and I promised you an activity that would work for ANYONE…..so here it is! Clean out your water table, dry it off and bring it inside!! Go to the store and buy some rice or uncooked beans of different sizes or shapes, raw noodles, anything you can buy in a bag that has a dry, non-sticky texture you can throw into the water table instead of water. This gives your child the ability to touch and feel what the different textures are like and to play with and feel the various shapes and sizes. At our house we throw in different utensils and cups. Sometimes cars, or Little People. Again, anything they want to explore with, I let them. They get to pour, or stack or put through a funnel the dried textures. Note: I’ve only used one at a time, the rice, the noodles or the beans not all 3 mixed together but you certain CAN do it either way! By playing with them separately it just makes for more days of a seemingly new activity. But I’m starting to think throwing in some penne, some spiral pasta and some bow tie pasta all at once would be super fun and cool! ……and if a water table isn’t in your future, don’t fret! Just empty out a storage bin your holiday decorations are in or where you keep your old sorority shirts or even a plastic shoe box bin that you can get at Target for $5 and let them run their fingers through the textures, bring out some utensils, some Little People, some cars, trains, trucks and let them play away just the same as they could with the water table! I hope this idea helps someone out there find a few moments of quiet for themselves and a fun new activity for a housebound munchkin! 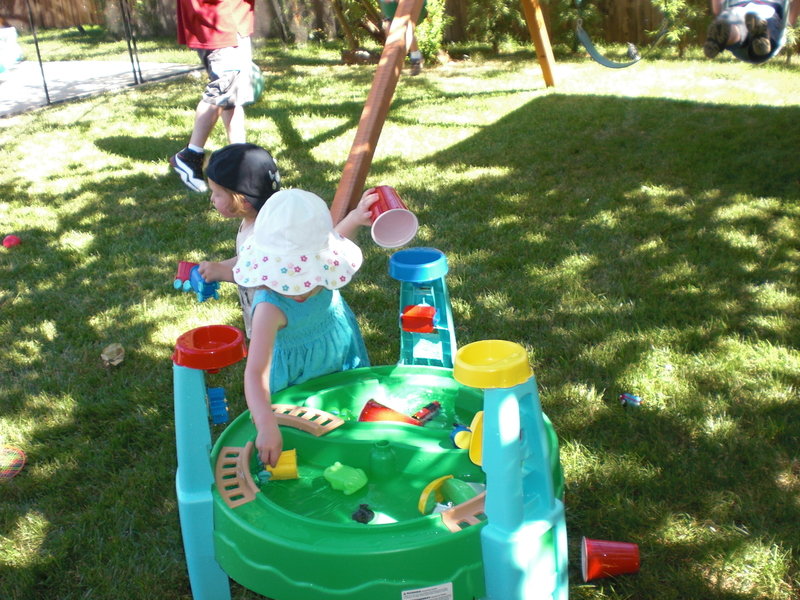 This entry was posted in life and tagged early childhood education, ideas of other uses for the water table, los angeles, picnic lunch, preschool director, southern california, sunny, swing set, toddler dexterity, toddlers, touching and playing for toddlers, true fact, water table. Bookmark the permalink.